Due to China’s expansive territories, opinions diverge on how many distinct regional cuisines exist in a land with such variety. Certainly the most notable division is found between the North and South regions of the country, officially marked by the Yangzi River. Generally speaking, rice products are found to be the staple grain for the southern and eastern regions of China and wheat products for the northern areas. One approach to describing the regional cuisine of China is to note the general characteristics of cooking and culture by location: North, South, East, and West. Some observers characterize those regional cuisines as sweet in south, salty in north, hot in east, and sour in west. China’s North has two very long and distinct seasons (winter and summer) with short transitional periods in between. Winters are dry and cold, with temperatures often below freezing. Summers provide intense heat and rain. Its diverse terrain (hills, valleys and rivers) give variety to the region’s agriculture. Due to the extremely dichotomous climate, the land’s produce is hearty: mainstays of wheat and corn, especially important to the Northern China economy, dominate the northerner’s dietary needs. Crops are then manufactured into wheat-flour for use in common cuisine: noodles, stuffed buns, dumplings and steamed bread are just a few of the wheat products consumed in the provinces of this region. Although little rice is grown in this region, other hardy plants such as barley, millet, soybeans, cabbage, squash and apples predominately appear in northern Chinese agriculture and cooking. Beijing is known for jiaozi, the traditional Chinese dumpling, and Peking duck. Jiaozi dumplings are often filled with pork and vegetables, but variations may include sweet fruits (dates) or chestnuts. Peking duck is a traditional delicacy perfected during the Qing Dynasty and served to important and wealthy individuals throughout history. The duck and its skin (a delicacy) are served with Hoisin (Peking) sauce in flat-bread wrappers. Northern cuisine includes the Henan (north of the river) region. Strikingly unique from other northern flavors is the Shaolin vegetarian cuisine. Chinese Buddhist belief has for centuries prohibited the eating of animal flesh, and the monks here have spent an age perfecting the cooking of all types of vegetarian food. This cuisine is very nutritious and healthy. Much of this region is considered sub-tropical and is green year round. As a consequence to the warm temperatures and lots of rain, high humidity creates a perfect climate for products with fastidious temperament: rice, tropical fruits and vegetables (especially of the tropical variety such as pineapple, lychee, oranges and bananas). Typhoons are common natural occurrences in the summer (July to September) and good times to visit are the spring and fall seasons. The winters are short (January to March), yet they can be surprisingly chilly. Southern Chinese cuisine gives elegance to simplicity. Cantonese cooking (Guangdong region) is renowned for its light flavors and cooking techniques (steaming and stir-frying) which pronounce the freshness of the ingredients. Often chicken, other fowl and fresh catches from the seafood embellish the striking color, flavor and delicacy of the cai of Canton. Rich with fruits and vegetables, Guangdong is also praised for its perfected tradition of presentation. Cantonese cooks often make artistic and colorful presentational accents such as radish roses. Another of the most noted regional creations is dim sum (“dot-hearts” in Cantonese), which are small bite-sized appetizer foods. Variety is the key to this tradition; some sweet, others salty, hot or cold, these small snacks can—in some restaurants on a busy day—be as numerous as 100 different choices! The eastern region of China is composed of Highlands and Lowlands. The Eastern Lowlands are rich in both natural resources like coal and iron, but, as the Yangtze River flows through the region, the best farming (flat land and sufficient rainfall) is found near the deltas. Farming techniques such as wet paddy planting (especially for rice) accounts for a large percentage of the region’s agriculture. The subtropical characteristics of the growing period also allow for the production of a wide variety of vegetable. Famous dishes and snacks include peony and swallow vegetable, fried purple crisp pork, lightly fried bean curd, jadeite shredded fish, scallion stewed sea cucumber, fruit juice and shrimps, stuffed bun steamed in small bamboo utensils, sweet and pleasant buns, egg cakes which is crisp outside and tender inside, steamed ravioli, hand-stretched noodles, braised cakes, etc. 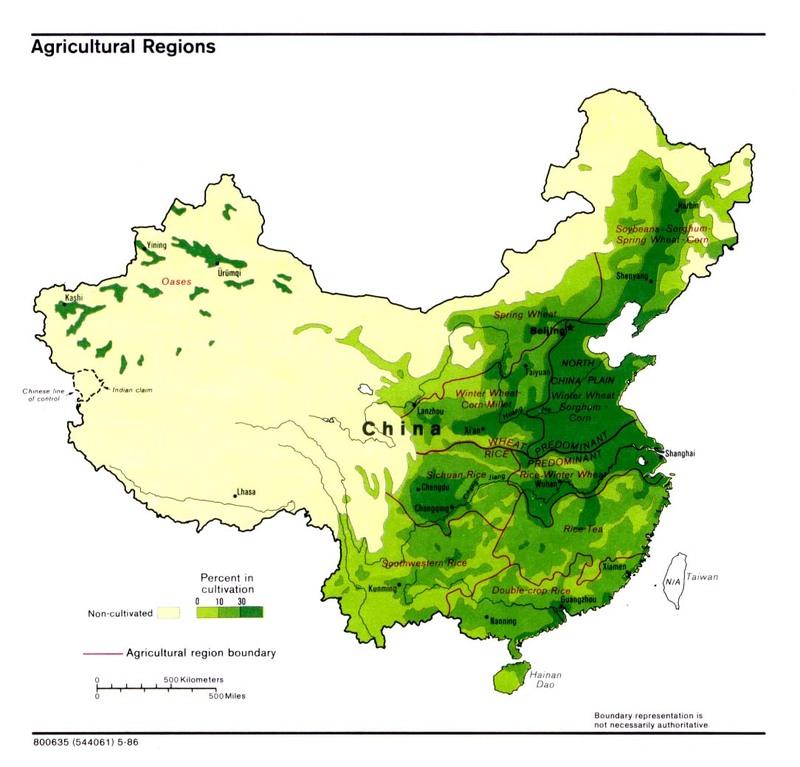 A basin in the southwestern part of the continent, Sichuan is one of the most agriculturally productive areas in China. The varying altitudes and wide range of temperatures and amounts of rainfall allow for the production of a wide range of crops, including rice, vegetables, and fruit. In addition to rice, Sichuan is known for bamboo, mushrooms, tangerines and the famous Sichuan chili peppers, some of the hottest in the world. China’s west also grows some of the world’s hottest chili peppers which have given Sichuan a reputation for heat. Hunan (south of the river) cuisine: Renowned for its soups, is one of the oldest and richest also noted for its spicy, pungent and flavorful dishes. Hunanes are especially fond of using chilis, sweet peppers and shallots in cooking. Famous for its heat and distinct flavors, Sichuan cooking mastered the light cooking techniques of stir-frying, sautéing, and dry-braising. One of the region’s most famous recipes is ma po doufu, a spicy bean-curd and vegetable dish cooked with some of the most powerful chilis in the world. In traditional Chinese medicine and nutrition, hot chili peppers are considered helpful in reducing the “internal dampness”. The humid climate also compels a creativity and variety in food preservation, including techniques such as picking, salting, drying and smoking. Photo taken last year on the Kharta Valley, the mountains in the background are the Tibetan Himalayas looking south into Nepal. Many of the cultures and cuisines that describe come from the majority, mainstream Chinese culture. However, without recognizing the diversity of the country and its peoples and cultures, this record would not be complete. China’s composition includes a variety of minority cultures—each, of which, has its own distinct customs, beliefs, and ways of life. Such diversity demands recognition. Two of the most well known and largest minority groups are that of the Tibetans and the Uyghurs. noodles that have its influences from the Chinese “la mien”, hand-pulled noodle. Naan is another cultural product, a flat bread popular in Xinjiang as well as in many central Asian cuisines. The autonomous region of Tibet also has a very distinct food culture that developed in the harsh climate and isolated land of Tibet. Tibetans are of two classes: nomadic or farmer. Mainly situated on the Tibetan plateau, the high altitude requires even hardier agricultural products: where it is too cold for wheat at some altitudes, the farming communities grow barley. The pastoral nomadic groups tend flocks of sheep as they move around the region. Mainstay foods, again, are meat (mutton, or sometimes yak), dairy and wheat. These groups, due to their high altitude and limited resources require a diet higher in fat and calories. Some of the most traditional and staple foods are butter tea (po cha), “Tsambpa”, barley-flour, sugar, butter and tea mixture rolled and eaten with fingers, or dried meat that will either be later barbequed or eaten raw. For further reading on this region, go to: http://www.uygurworld.com/_sgt/m3_1.htm.